As a general dentist and board certified prosthodontist, Dr. Schumacher wants to have a complete picture of your oral health needs. A visual exam provides only part of the necessary information. That’s why digital radiography plays an important role in the care we provide. 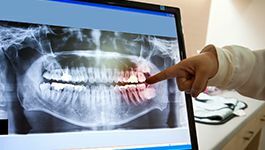 Digital radiography reveals details about your teeth, gums, and underlying oral structures than would be possible to see with a visual exam. Using this information, Dr. Schumacher accurately diagnoses your needs. Detailed X-rays help Dr. Schumacher formulate a more detailed treatment plan. Aside from revealing important information about your smile, there are other notable benefits of digital radiography. First, digital radiography is a safer alternative to traditional radiography because it emits 90 percent less radiation. The images captured by digital X-ray don’t have to be developed the way a traditional X-ray would. Instead, we view them instantly on a nearby monitor. Finally, we don’t physically store X-rays. Instead, we simply back them up on our computer for later reference. Would you like to learn more about digital radiography and its benefits? Don’t hesitate to contact our Wakefield dental office. A member of our team would be happy to answer questions or schedule an appointment.